I’m Stacey, you may know me as @farmhousechic4sure on Instagram. I’m a busy mom of two, a wife, and a full time home care nurse. 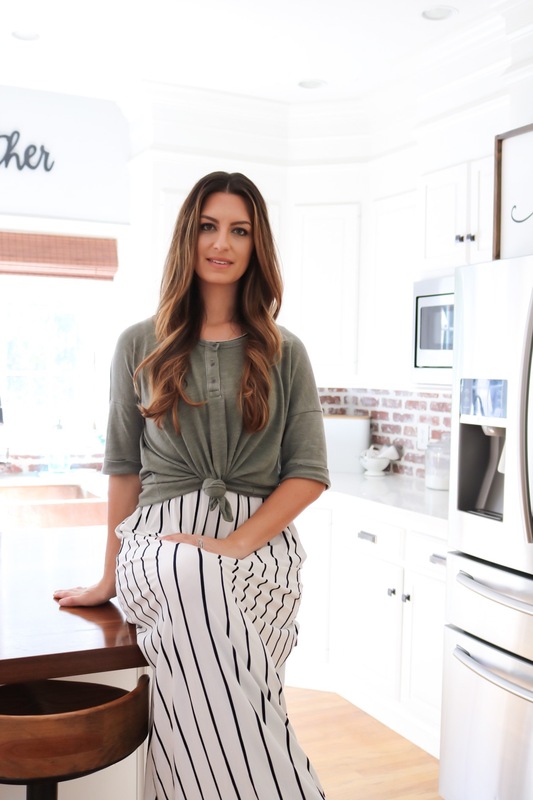 I love DIY and all things modern farmhouse style. I’m a huge DIY hobbyist, and have multiple projects on my to-do list at any given time. Ask my husband, my mind goes faster then I can keep up with. With two daughters ages 6 and 9 we are constantly on the go, keeping up with school schedules and activities. We live in the beautiful state of Connecticut, where two incomes is a must. That means both my husband and I hold demanding jobs, each working 40-60+ hours per week. This leaves little time for household duties, much less anything else. To me, its important to balance work, family, and leisure time. Oh, and you must sneak some “me” time in there too. Thats a lot of things to pack into 24 hours, just thinking about it has my head spinning. So functionality and low maintenance are high on our priority list when completing any project. We purchased our home just over 3 years ago. At that time it was nearly 12 years old. What may have seemed functional and stylish when the house was built was not suitable to us and our family. I’m a huge believer in making use of every square inch. Functionality is so important and that was missing from the original kitchen design. So much space was wasted and the look and feel was dark and dated. Character, which is also important to me, was minimal at best. 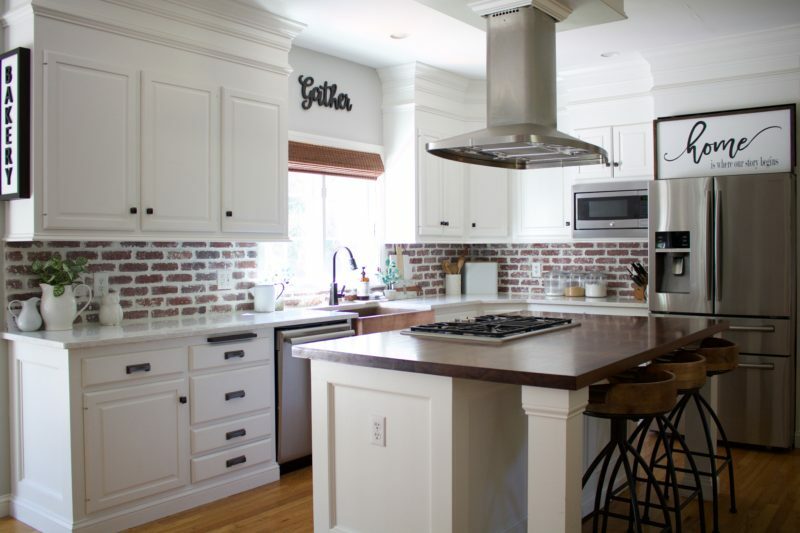 We loved the layout and open floor plan of the main level but knew a kitchen remodel was a must. Pinterest. Pinterest. Pinterest. And a little bit of Google. 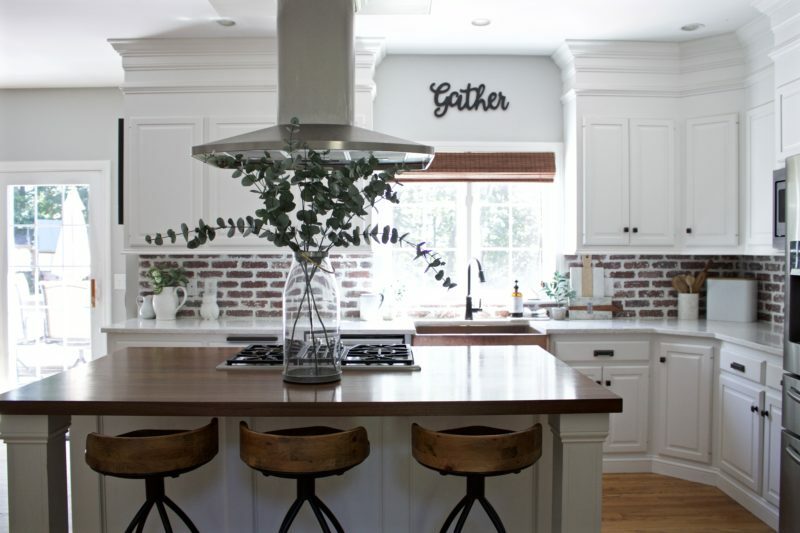 As soon as our offer was in on the house, I started pinning to my kitchen makeover board. 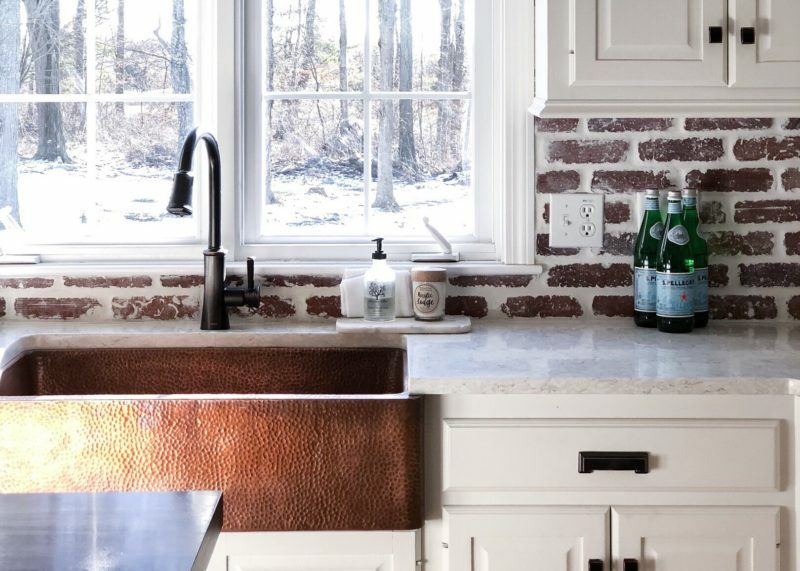 Saving everything from “How to make Ugly Cabinets Look Great” to “Hammered Copper Farm Sink Design Ideas.” I took to Google, for what seemed like hours, and scrolled through hundreds of kitchen images. Screen shot-ing more images then I’d care to share and making mental notes of design elements that were a must in our remodel. To see some of my favorite inspiration, you can follow me on Pinterest here. 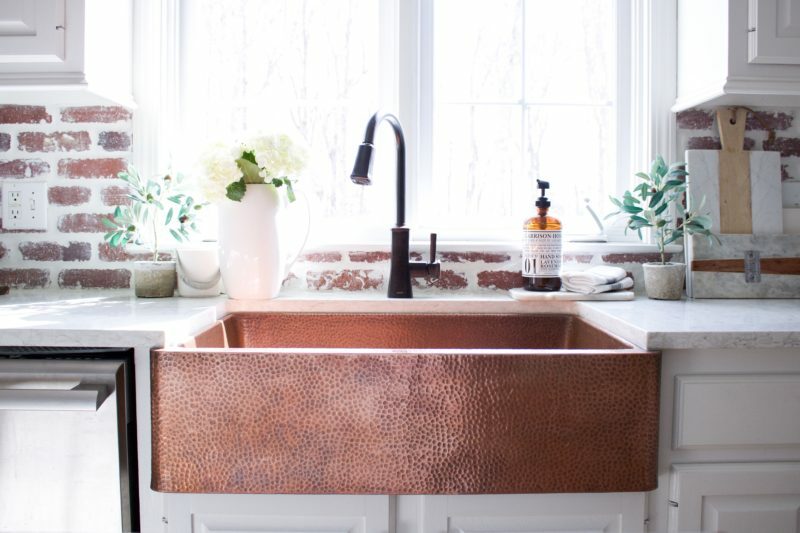 In the beginning stages of planning our kitchen remodel I didn’t know I wanted a copper sink. I knew I wanted a modern farmhouse look with some added warmth. 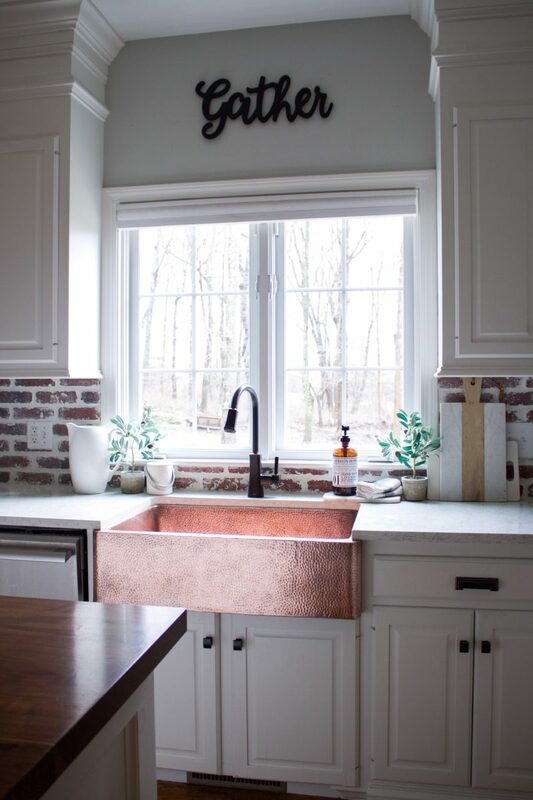 In my search for farmhouse sink ideas I came across the Adams Farmhouse Copper Sink. It was love at first sight. Maybe more like an obsession. I was mesmerized by how gorgeous the hammered copper design was. Modern farmhouse can, at times, seem a bit sterile with so much white and clean lines. 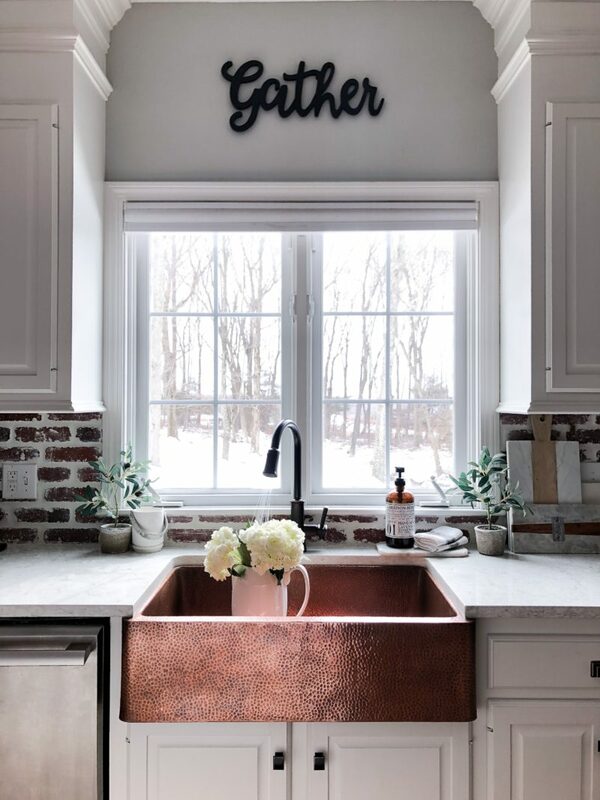 A copper sink added just the right amount of warmth, while still keeping with the modern farmhouse feel I wanted. First and foremost, it is STUNNING! Absolutely stunning! Did I say that already?! 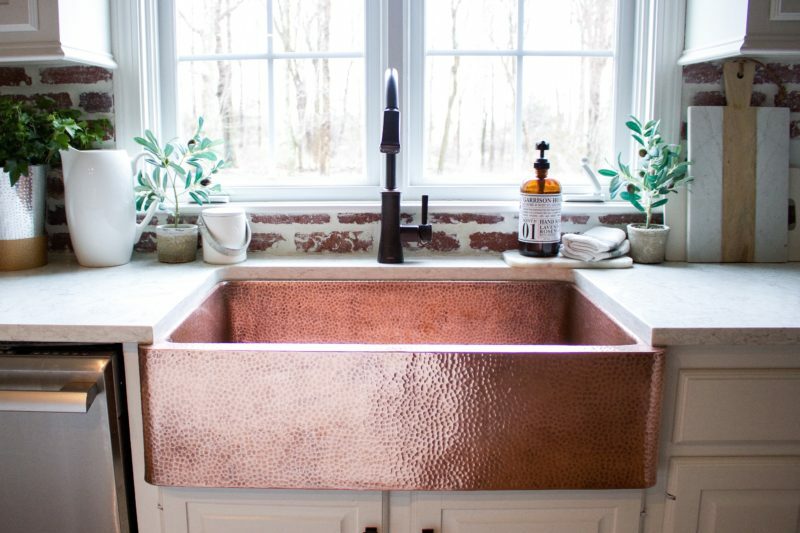 In all seriousness the copper sink is very beautiful. It stands out against our white cabinets, and that’s what I love most. I love classic design elements but at the same time I like to incorporate pieces that make a statement. Sinkology, you designed just that with your copper sink line! Its all about the reviews! I always go straight to the reviews when considering a product. My husband thinks I’m a little OCD when it comes to reading reviews. But, there’s nothing better then an honest consumer’s opinion. I read most, if not all reviews and at 4.5 stars Sinkology’s copper sinks have the best ratings. Next in line to reviews is cost. Where my husband says “you get what you pay for,” I disagree. There are certainly ways to balance budget and quality. Sinkology’s product quality is phenomenal, the reviews will tell you so. But most importantly the purchase price is significantly less then that of other brands. Sinkology has managed to produce an affordable copper sink without jeopardizing the design or quality. This budget friendly option was a huge deciding factor. 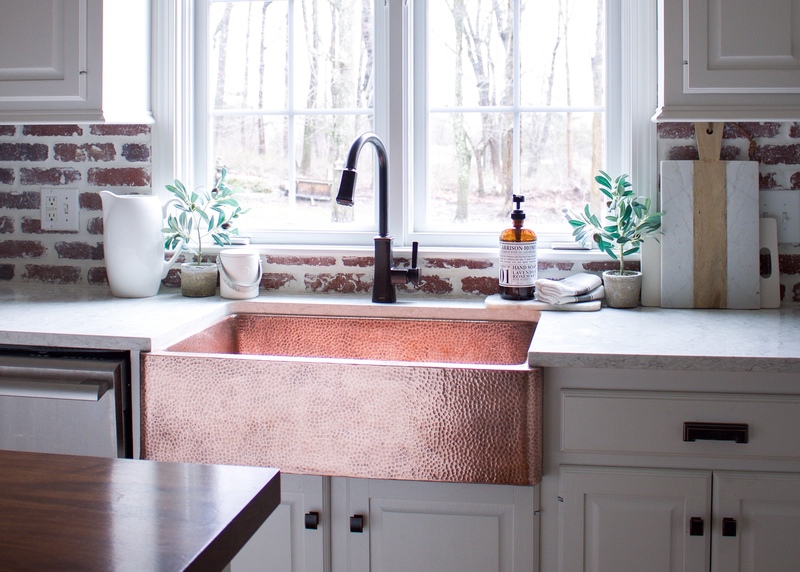 As mentioned earlier, the copper sink makes a design impact. It was important to me to create a space where the beauty of this sink would stand out. 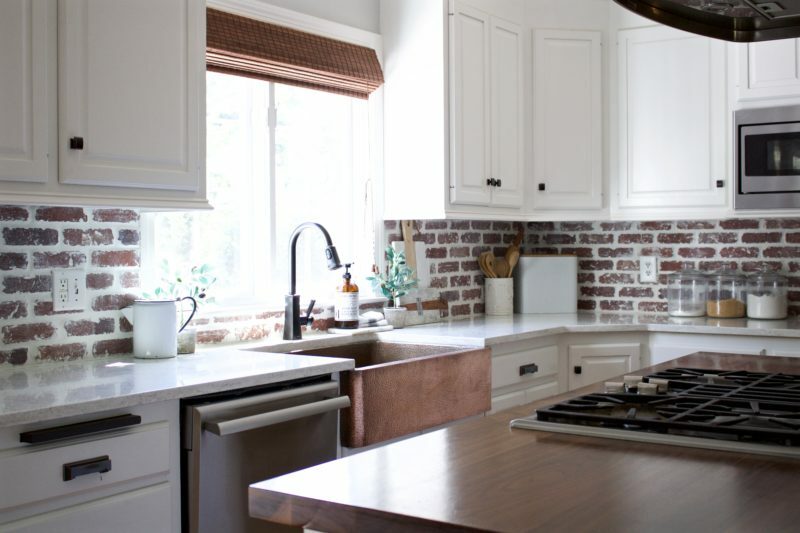 In doing so, I chose white cabinets in Benjamin Moore Simply White and pulled in some warmer tones with a brick backsplash and an contrasting wood kitchen island countertop. Each of these features compliment one another and work so well together in creating a warm modern farmhouse feel. 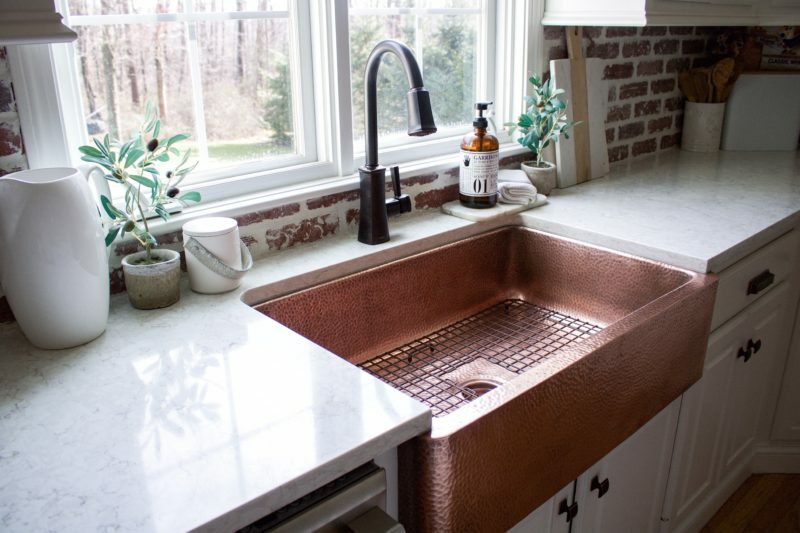 Maintenance is one of the most asked about topics I get on my copper sink. 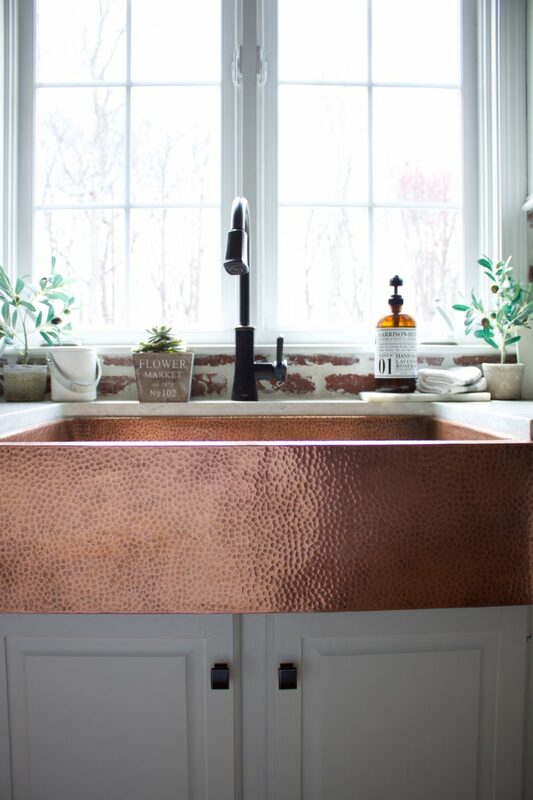 The beauty of copper is that it can be as high or low maintenance as you want it to be, or as you have time for it to be. Copper does this amazing thing called patina. This is the darkening of the copper over time. If you want your sink to have that warm brown tone to it, its fairly low maintenance. I suggest cleaning your sink with warm water and a mild soap, such as Dawn Original dish soap, 1-2 times per week. It is a sink after all and you’ll want to wash out the residue from food and liquids. 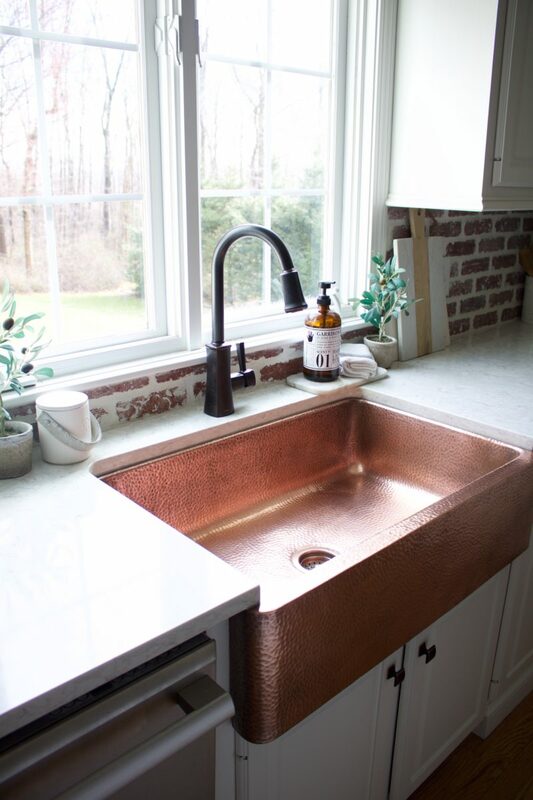 I prefer a more polished look to our copper sink. This look is not much, if any, more maintenance then any other sink. To get the shiny and polished finish I give the sink a good scrubbing, again with warm water and Dawn dish soap, 1-2 times per week. Remember to dry out the interior of your sink. If polished is what you want, drying the basin out with a soft cloth will slow down the patina process and keep your sink shiny for longer. I also spray our sink with Copper Armor after each scrubbing, this protects the finish from water spots. Getting a sink bottom grid is a must and something I have. If you have children like mine that love to throw their utensils into the sink, a bottom grid will keep those spoons and forks off the surface of your sink and help prevent unwanted marks. Absolutely, go for it! 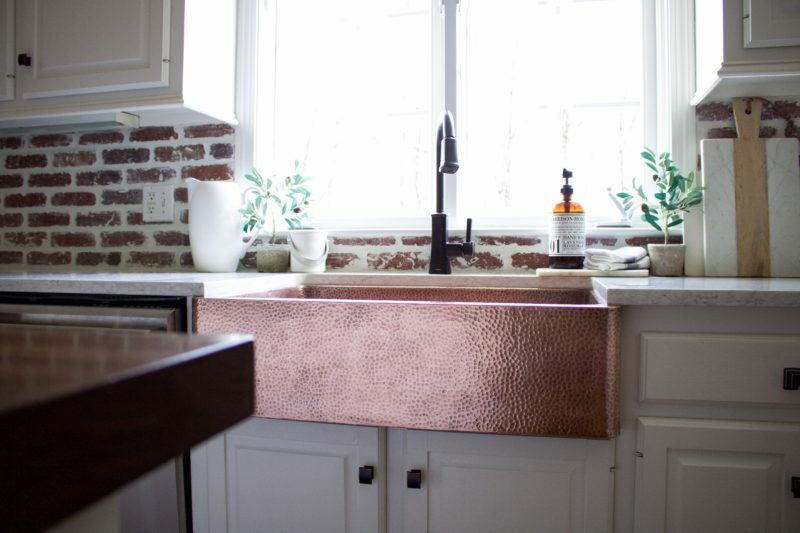 I would recommend a copper sink to anyone remodeling their kitchen; friends, family, and strangers alike. Theres nothing to be afraid of. 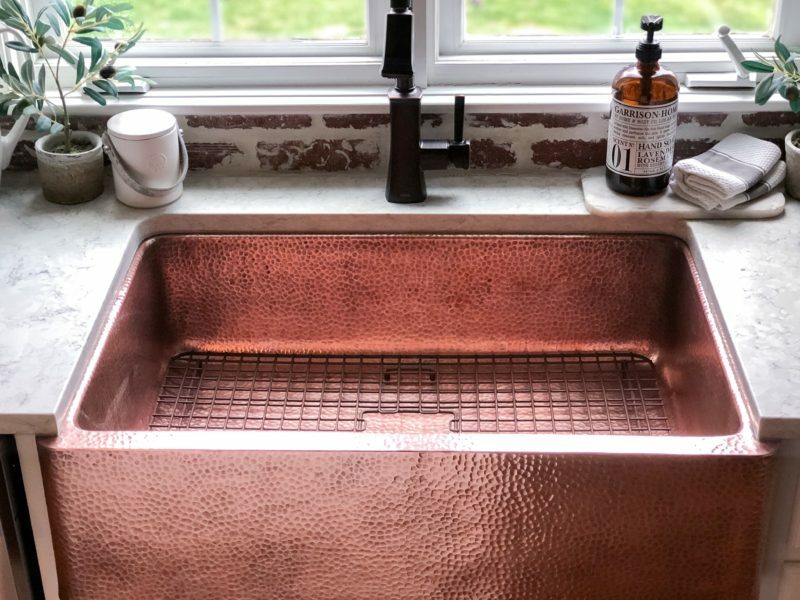 All sinks require cleaning from time to time and copper is no different. Plus its unique, and beautiful, and can be incorporated into any design style. Once we finalized the products we would be using in our kitchen remodel things went fairly smoothly. I think the biggest challenge was finding the time to DIY this remodel. We needed to stick within a budget so hiring someone to do the work for us was out of the question. The bulk of our budget went to countertops (if you saw what the countertops were before, you’d understand why). So, I knew I’d be doing the majority of the work myself. This was my first major DIY and my husband had not yet developed a liking to DIY projects. With two little kids and a full time, third shift (I still don’t know how I survived that), nursing job time was definitely lacking. Remodeling our kitchen took about 2 months, which included every second I wasn’t at work and weekends. I can say, it was all worth it and I’d certainly do it over again if I had to. There’s something about the end result of a DIY project thats so rewarding, no matter how long it takes. *This post was written in partnership with Sinkology. All thoughts and opinions are of my own. Hi! I’m in love with your kitchen! Like you, I’ve searched and searched and screen shotted so many ideas and your kitchen really pulls together all my ideas! Can you share where your cabinet hardware cane from? Thanks!!! Hi Kaci! Thank you!! Feel free to email or DM me on Instagram and I will get your the info on the hardware. Hi there! I love your posts. 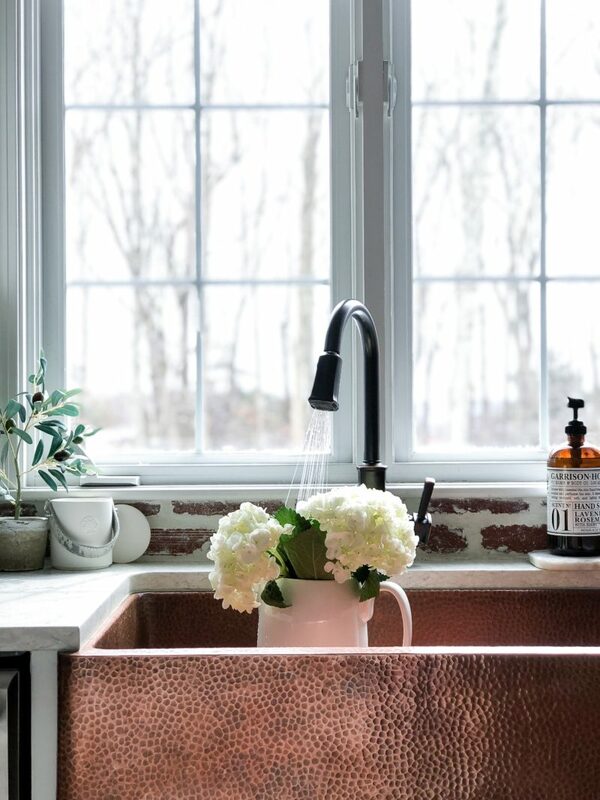 I myself have a copper sink and I love it. Can you please tell me what kind of polish you use? Thank you! Hi Veronica, Thank you! That is much appreciated. I use Bar Keepers Friend!